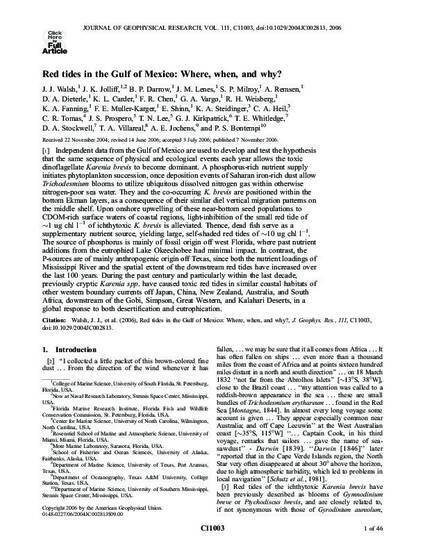 Red Tides in the Gulf of Mexico: Where, When, and Why? Independent data from the Gulf of Mexico are used to develop and test the hypothesis that the same sequence of physical and ecological events each year allows the toxic dinoflagellate Karenia brevis to become dominant. A phosphorus‐rich nutrient supply initiates phytoplankton succession, once deposition events of Saharan iron‐rich dust allow Trichodesmium blooms to utilize ubiquitous dissolved nitrogen gas within otherwise nitrogen‐poor sea water. They and the co‐occurring K. brevis are positioned within the bottom Ekman layers, as a consequence of their similar diel vertical migration patterns on the middle shelf. Upon onshore upwelling of these near‐bottom seed populations to CDOM‐rich surface waters of coastal regions, light‐inhibition of the small red tide of ∼1 ug chl l−1 of ichthytoxic K. brevis is alleviated. Thence, dead fish serve as a supplementary nutrient source, yielding large, self‐shaded red tides of ∼10 ug chl l−1.The source of phosphorus is mainly of fossil origin off west Florida, where past nutrient additions from the eutrophied Lake Okeechobee had minimal impact. In contrast, the P‐sources are of mainly anthropogenic origin off Texas, since both the nutrient loadings of Mississippi River and the spatial extent of the downstream red tides have increased over the last 100 years.  During the past century and particularly within the last decade, previously cryptic Karenia spp. have caused toxic red tides in similar coastal habitats of other western boundary currents off Japan, China, New Zealand, Australia, and South Africa, downstream of the Gobi, Simpson, Great Western, and Kalahari Deserts, in a global response to both desertification and eutrophication.